Storm accompanied with high speed winds and lightning claimed lives of three women in Manipur while more than a dozen people including students were injured on Monday morning. Windstorm, which came at 10 am, rendered many people homeless after their houses were destroyed. Electric poles were damaged in Churachandpur town. The windstorm badly hit three districts of the state including Bishnupur, Kakching and Churachandpur, official sources said. 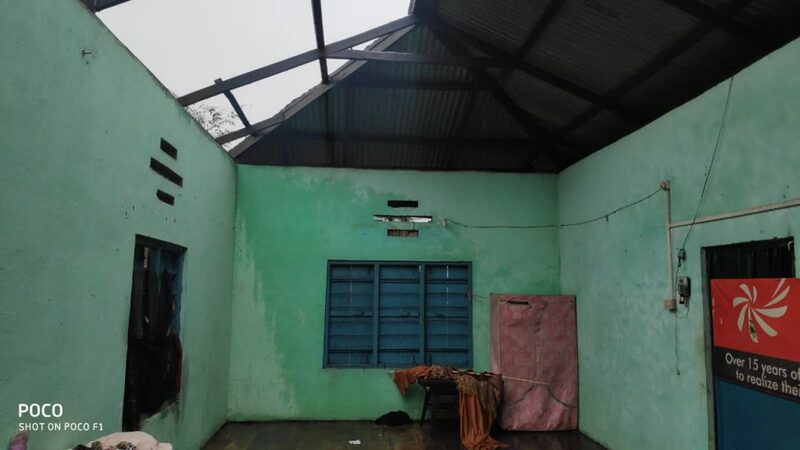 Two women lost their lives after the house, where they took shelter during the storm, collapsed at K Salemjang village, located about 7 km north-east of Churachandpur town under Samulamlan sub-division of Churachandpur district, reports available here said. The deceased have been identified as 74-year-old Nemden of Salemjang village and 50-year-old Chinkholhai of Kulbung village. On the other hand, another woman, identified as 56-year-old Y Nungsitombi of Kakching died when a tree fell on her tea stall at Wairi area under Kakching district, sources said. An old age home building at Kumbi and a creative school building at Kwakta besides another school for persons with disabilities at Thanga, all in Bishnupur district, were badly damaged while seven students were injured in the storm. Imphal town also witnessed a short spell of windstorm forcing inconvenience to the officer-goers, passer-bys in and around Khwairamband Keithel, a business centre. There are also reports of many houses being damaged in Jiribam district bordering Cachar district of Assam and other areas of Manipur. A senior district official of Churachandpur district, when contacted over the telephone, said that they would compile a complete report once the officials concerned submit their findings in the district. Stating that they have received reports of damage of many houses, the official said the state power department officials are also taking up steps to restore the power supply. Though the northeastern states have been witnessing moderate to heavy rain and thundershowers for the last two days, Manipur witnessed hot days and recorded maximum temperature of 39.4 degree Celsius on Sunday. But Monday’s short spell of rain brought down the temperature to 34 degree Celsius on Monday. Meanwhile, Manipur’s chief electoral officer PK Singh in a letter addressed to the deputy election commissioner of the Election Commission of India (CEC), New Delhi on April 15, stated that all the district election officers of the state have been advised to take up relief works through the official machinery as per the code of conduct. The Inner Manipur Lok Sabha constituency will go to polls in second phase on April 18.